Q) How has the company’s business changed post-GST? Do you see any changes in the logistics system? Dealers had destocked when the GST was introduced and after its implementation, they were adjusting to the new system. Things have started to stabilise September onwards. If you look at only one quarter, there is more disruption than gain. In the long term, there will be more gains. We see a 10-15 per cent productivity improvement in logistics. We cater directly to the transportation industry, so if inefficiency of trucks at nakas goes away, it would be help us. Q) What kind of market share does Ceat have in different segments? Where do you see potential for further gain? We have a market share of about 28-30 per cent in the motorcycle and scooter tyre segment. In trucks and passenger vehicles, we enjoy about 12-13 per cent and 10 per cent market share, respectively. We are focusing on the passenger vehicle segment as it will grow faster than any other segment. This is a category where the customer is willing to pay a higher price. Q) What about the two wheeler tyre segment where new players have entered? Our market share has grown very well over the last five years. Until a few years ago, it was about 12 per cent or so, we have moved to 30 per cent now. We have also strengthened our relationship with a number of auto players such as Hero MotoCorp, Royal Enfield, Honda and Bajaj. Q) Rubber is a key commodity for you. Has the price fluctuation affected Ceat? Early this year, rubber prices had shot up. From Rs 110-115 per kg in middle of last year, it went up to Rs 150 and then came down to Rs 130-140. It is higher if we see the year-on-year price, but is now stable and should range between Rs 135 and Rs 140 per kg. Q) How do you see tyre prices moving up from here? It will depend on the competitive environment. We did indulge in a price increase in the first quarter, when rubber prices moved up. Further action will depend on how the raw material moves. As of now, there is no immediate decision waiting to be taken on prices. Q) Import of truck tyres from China had been a concern for some time. How are things now? The import situation is getting better. The import of the radial tyres for trucks had a 30 per cent share in the aftermarket. However, after demonetisation, it came down and the GST regime also increased compliances. An additional duty has been imposed recently. The imports from China have come down. I don’t think it will go down to zero per cent, but may halve from a share of 25-30 per cent. Q) Could you share a few priorities for the next couple of years? The first is to continuously improve our distribution and reach in the market. 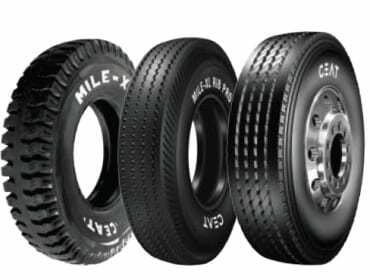 We want to expand in rural areas for two wheeler tyres, and do same for truck and car tyres. We wish bring different products for our customers, like we did when we came out with puncture-safe tyres for motorcycles.